While I was up visiting Mum and Dad, I was left to my own devices for a significant amount of time. 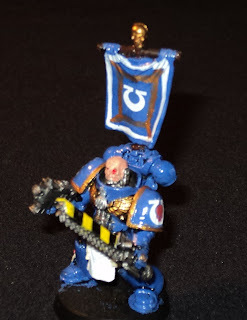 So I painted up some Space Marines from a tactical squad kit. For the first time I attempted a couple of colour schemes other than the Ultramarine scheme just to see how they would turn out. This morning after I returned to Toowoomba, I pulled out the undercoated Sergeant and painted it up as well. To begin, I spent a few hours gluing the seven models together. Five of them had bolters, one a heavy bolter, and one a flamethrower. The green cover in on Mum and Dad's pool table. Next, I applied the Chaos Black undercoat. The next stage was applying the colour scheme and decals. I painted two of the standard bolter-equipped Space Marines along with the heavy weapon-equipped Marines in the Ultramarines colour scheme. I then experimented with three other paint schemes. From left to right, Black Templars (black and white), Blood Angels (red), and finally Imperial Fists (yellow). These may not look perfect, as I really should have applied a white undercoat instead of black. The white and yellow required many coats to be properly applied. Upon returning to Toowoomba, I painted the Ultramarine Sergeant I had previously undercoated. Unfortunately the photo I took is a bit blurred, possibly due to the darkness of the room (it is quite overcast here today). He is equipped with a bolt pistol and a chainsword. So, here is a shot of the Ultramarine squad members I painted over the past few days. And finally, a picture with some older Space Marines, the Dreadnought and the Drop Pod I have previously painted in the Ultramarines paint scheme. I have a couple other squad kits, but may wait a while before doing some more, but I hope these look alright.